William Dongois, Franck Poitrineau and Stefan Legée founded the Ensemble Ventosum in order to perform historically correct interpretations of the music for their instruments – cornetts and sackbuts (baroque trombones). An important concern of the ensemble is cooperation on equal terms between all the musicians without any fixed hierarchical structure - this enables them to play freely and creatively, combining musicological knowledge with a zest for improvisation. 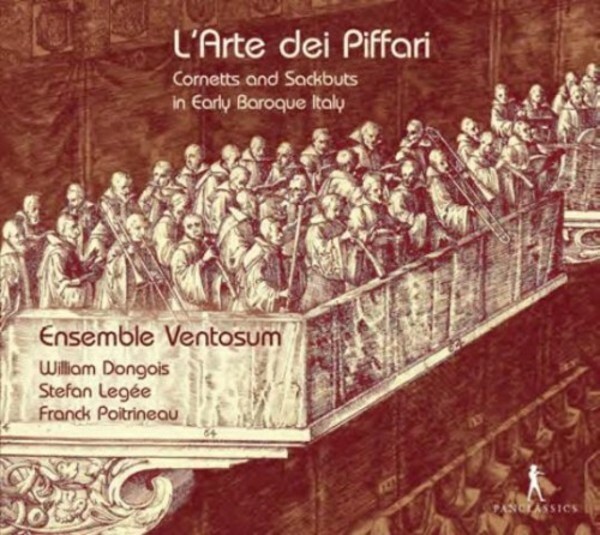 The Ensemble Ventosum introduces Italian music from the 'golden age' of cornetts and sackbuts - which lasted from about 1580 to 1650 - on the CD 'L’Arte dei Piffari'. It includes works for grand princely weddings and dances, as well as instrumental motets and madrigals, providing a representative overview of the wide variety of applications of these instruments and the 'art of the winds' (L’Arte dei Piffari) of this epoch.